Going to Hawaii? Pack your umbrella! I’ve got some bad news for folks in Hawaii: It looks like you have some thunderstorms headed your direction! Niihau, Kauai, and Oahu are all on flash-flood warnings. A flash flood is what happens when it goes from a typical sunny and warm Hawaii day… to pouring rain. The soil in the ground can’t absorb the water fast enough so it floods roads, gardens and even houses. Yikes! Some people think that it’s always sunny in Hawaii. I’m sorry to tell you this — it’s not true! It is not unusual to have rain in Hawaii at this time of year. The rainiest months are from November until March. However, all the islands of Hawaii are checkered with micro-climates. That means it can be raining in one part, and sunny a few minutes away! Generally, the western and southern sides of the islands are sunnier — while the northern and earthern sides are chillier, and more rainy. On the Big Island, the annual rainfall of Kona is 5-6 inches of rain a year while in Hilo gets more than 180 inches! 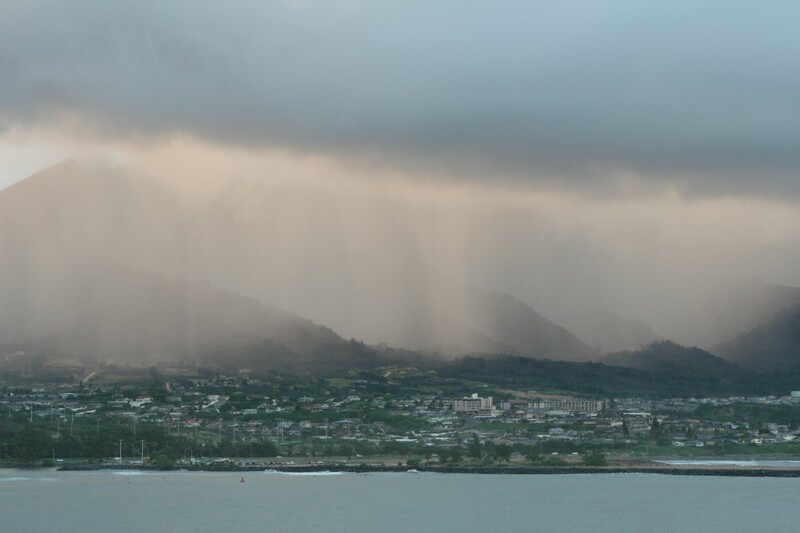 Thanks to Hovergirl for this incredible photo of rainy Maui.